Tired of their servitude to man, a group of farm animals revolt and establish their own society, only to be betrayed into worse servitude by their leaders, the pigs, whose slogan becomes: “All animals are equal, but some animals are more equal than others.” Published in 1945, this powerful satire of the Russian Revolution under Stalin remains as vivid and relevant today as it was on its first publication. We originally needed to study this book for English class as an example for an allegory (a kind of extended metaphor). To understand this book better, we also had to read about the history of the writer. George Orwell wrote this book during the Second World War and in that time, Russia had a change of leaders and Stalin was one of them. Orwell wrote this book as a parallel to the Russian Revolution. A series of events that happened in Animal Farm also happened similarly in Russia and certain attributes from people in the Russian Revolution were given to the animals. Like, pigs were the leaders (Stalin and Trotsky) and the rest of the animals were the followers. The overall plot of this book is that the animals wanted to overthrow the humans and the animals wanted to run their own farm independently. The pigs founded the rules of Animalism and that every animal is equal. 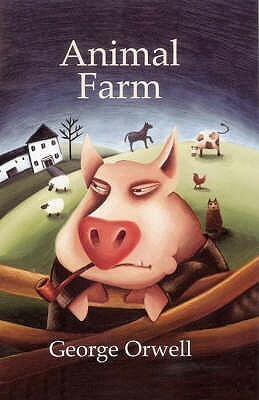 While reading this book I started getting more and more annoyed at the pigs. I especially disliked Squealer because he was always bringing the news to the animals and fooling them, telling lies. While he was talking I was always thinking that the pigs could always find some kind of excuse for doing something forbidden. I liked Boxer and Clover though because they are so innocent and only want the best to happen. The writing style was easy to read. It was mostly straightforward expect for when the writer didn't want to say that someone did something wrong in the book. As an example, Napoleon was left behind with the milk and all the Orwell wrote, was that when the animals came back, the milk was gone. Also the wording in the last paragraph of this book was kind of sad. Somehow the writing style improved my final rating because I just couldn't put the book down and finished it in a day. I give it 4 out of 5 stars. Very, very, very exciting news!!! Rick Yancey - "The 5th Wave"